Even if one should be familiar with the “filibustering” attempts in the 19th century, where various private, mostly American, individuals made an effort to invade or takeover multiple foreign countries in the Western Hemisphere, anything that provides a fuller and specific look at this era should be appreciated. These efforts tended toward incorporating the target countries into the United States as part of an extension of our “peculiar institution”: slavery. With any such extension cut off to the west by constitutional obstacles, climate or topographical unsuitability and to the north by the institution’s abolition, there was only one direction in which to look: southward. Southerners had coveted the purchase of Cuba from Spain for a variety of reasons but diplomatic negotiations were fruitless and that brought other Central American countries into their line of sight. The most prominent of these filibuster adventurers was William Walker who made multiple, ongoing attempts to lead his own private army of individuals from as far afield as California, New York, and Louisiana and proclaim himself initially as a national leader prior to any thought of annexation by the United States. Walker’s initial attempt came from the direction of California and was directed at Mexico and its Baja Peninsula where he hoped to establish an ostensible Republic of Sonora. Successful at first, he and his “army” eventually returned to the United States and made further efforts to recruit more men and raise money for another expedition. His next target, Nicaragua, was already a state in political turmoil and had been for some years. Walker was able to install himself as “president” and considered himself as such from then on, as the three political factions there were sufficiently at odds to prevent the result. Again, he was ultimately forced to retreat to the United States where he was subjected to the consequences of having violated the United States’ Neutrality Act which forbade private American citizens from interfering with the political processes of or otherwise taking over foreign countries. However, ostensible Nicaraguan citizenship and as its “president” resulted in his being acquitted and he again made plans to recruit and raise money for a final expedition. Setting sail again, this time for Honduras, he and his men were now in the sights of not just combined Honduran and Costa Rican forces but also the British Royal Navy and the personal animus and industrial might of tycoon Cornelius Vanderbilt whose ships and facilities Walker had taken over previously in his Central America imbroglios. The latter two were resolved to stop Walker as part of their plans to build a cross-isthmus canal connecting the Atlantic and Pacific Oceans and to make money from the human traffic headed west to the California gold fields. Unable to effectively oppose the forces arrayed against him due to disease and combat casualties, Walker’s time ran out and he finally faced a firing squad as had others who he believed had crossed him previously in his forays. 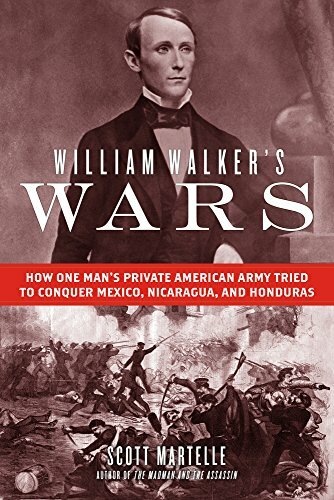 If the cover photograph is any indication, Walker does not appear as someone who would be willing to undertake repeated missions against foreign countries, especially with minimal numbers of supporters in the ranks of an army. He looks as unassuming, introverted, and retiring (not to mention cleanshaven) as a clerk in a certain Dickensian office setting. Yet his forceful personality and charisma were such that he was successful in luring fellow adventurers to support him. Until his demise, he was able to wiggle off the legal hook of consequences, internationally and domestically. Within the text are maps that detail the countries and locations where Walker operated and describe the strategic setting with regard to the proposed trans-isthmus canal and transit routes across Central America. Included as well are portraits and numerous illustrations and drawings from the Library of Congress, other archives and the 19th century Frank Leslie’s Illustrated Weekly. Although author Scott Martelle is not a historian, this narrative is well researched from books, articles, dissertations, papers, journals, contemporary newspapers, and other sources. It is also well written although one might need a cue card to keep track of the many players. Had Walker bent his life’s efforts toward more constructive pursuits, it’s hard to tell what he might have accomplished. For an interesting look at a largely obscure part of United States history, this volume is highly recommended. Stuart McClung holds a Master of Arts in Military History and has written reviews for the Journal of America's Military Past and Humanities and Social Sciences Online. He is a recognized long-time living historian and interpreter at Gettysburg National Military Park and various state and local venues. He is also a member of the Society for Military History, the Council on America's Military Past, and the Civil War Trust.